Deposing an Expert Witness Thank you to the hundreds of 8 5 tips for success. people who have contributed toPresident's Page SANDIEGOLAWYER By John Gomez 39 Thoughts from throughout theMcLaughlin Bar. Marcella 112 issues and 6,576 pages San Diego Law Library By Loren Hands-On Freestone Border law is the big topic of 2017. #sdlaw Our legal community online and around town. Photo Gallery Colleagues connecting at recent events. Correction: In the "Distinctions" column of the January/February 2017 issue of San Diego Lawyer, the information regarding Hon. Cynthia Freeland was incorrect. Hon. Cynthia Freeland was appointed as judge to the San Diego Superior Court in December 2016. San Diego Lawyer regrets this error. Issue no. 2. San Diego Lawyer™ (ISSN: 1096-1887) is published bimonthly by the San Diego County Bar Association, 401 West A Street, Suite 1100, San Diego, CA 92101. Phone is 619-231-0781. The price of an annual subscription to members of the San Diego County Bar Association ($10) is included in their dues. Annual subscriptions to all others, $50. Single-copy price, $10. Periodicals postage paid at San Diego, CA and additional mailing offices. POSTMASTER: Send address changes to San Diego Lawyer, 401 West A Street, Suite 1100, San Diego, CA 92101. Copyright © 2017 by the San Diego County Bar Association. All rights r­ eserved. Opinions expressed in San Diego Lawyer are those of the author only and are not opinions of the SDCBA or the San Diego Lawyer Editorial Board. Are you tired of waiting for your current broker to pull a rabbit out of a hat for your upcoming renewal? XL Catlin is a financially stable, global company, currently rated “A” (Excellent) by A.M. Best and Admitted in California. 401 West A Street, Suite 1100, San Diego, CA 92101 Phone (619) 231-0781 bar@sdcba.org Fax (619) 338-0042 www.sdcba.org Interested contributors may submit article ideas to the editors at www.sdcba.org/SDLidea. Unsolicited articles will not be printed in San Diego Lawyer™. San Diego Lawyer™ reserves the right to edit all submissions, contributed articles and photographs at its sole discretion. 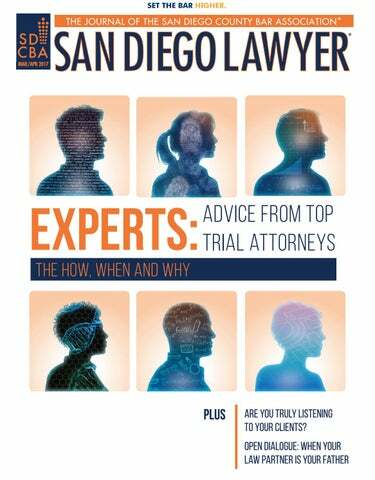 The opinions expressed by the authors and editors in San Diego Lawyer™ magazine do not necessarily reflect an official position of the San Diego County Bar Association. FOR ADVERTISING INFORMATION, CONTACT LAURA TARABINI AT (760) 415-7030 OR LTARABINI@YAHOO.COM, OR VISIT WWW.SDCBA.ORG/ADVERTISING. an Diego is a town of lawyers and practices as varied as can be, and that’s part of what makes our community so special and dynamic. Collectively and individually, each SDCBA member contributes to the betterment of our profession and our community. 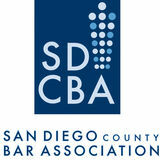 The SDCBA is our professional association — we all belong here and have a valuable perspective to share. For this issue of San Diego Lawyer, I’ve invited individuals in various practices and stages in their careers to share their views on the challenges facing the profession and their individual work. Enjoy. WHAT IS THE BIGGEST CHALLENGE YOU ARE FACING IN YOUR PRACTICE? The San Diego business market is thriving, but it is thriving with small businesses. Big law rates are often not compatible with small business budgets, so it can be a challenge to come up with alternative fee structures that suit our diverse client base and also make sense for the firm. WHAT DO YOU THINK IS THE BIGGEST CHALLENGE TO THE PROFESSION CURRENTLY? Evolving past the billable hour. Nowadays, attorneys want to be rewarded for the quality of work, not the quantity. We want work-life balance. Additionally, clients often prefer fixed fee arrangements as opposed to billing by the hour. Both of these sentiments suggest a desire to move away from the billable hour, but the market has not yet caught up. BIGGEST CHALLENGE IN YOUR PRACTICE I am a sole practitioner with modest technology skills. Electronic communications and transmissions have been a tremendous help to me in efficiency and costs savings. However, keeping up with advances in technology affecting how lawyers communicate with clients and advocate on their behalf will be my biggest challenge. My son Sam who is a new lawyer helps me mitigate this challenge. BIGGEST CHALLENGE TO THE PROFESSION The growth of internet based legal service vendors provides consumers access to low cost legal services in areas including business entity formation and transactions, estate planning, trademarks and patents, real estate leasing and deeds, and marital agreements. As a result, I have seen new business clients who have filed articles of incorporation and had a nice minute book but not much else. I have seen estate plans which had no assets transferred into the trust. The challenge for lawyers competing with these vendors is to demonstrate the value of their more expensive — but more personalized and thorough — legal services. BIGGEST CHALLENGE IN YOUR PRACTICE The biggest challenge I am facing in my practice is the lack of community resources and facilities to help clients successfully transition from jail or prison to the community. There is also a shortage of beds at treatment facilities and a lack of housing resources for our homeless clients. In San Diego particularly, it is important to understand that our homeless population includes some of our military veterans (a lot of whom are dealing with Post Traumatic Stress Disorder in addition to homelessness). As a public defender, I routinely collaborate with social service providers on behalf of clients to help them get back on track in an effort to cultivate and support positive lifestyles and in turn reduce recidivism. BIGGEST CHALLENGE TO THE PROFESSION I believe the biggest challenge to the profession currently is increasing the number of individuals from diverse backgrounds in the practice and administration of law. Our bench and bar should reflect and honor the richness of the diverse cross-sections of our communities. Because of this, there is a strong need for early intervention pipeline diversity initiatives. While we must acknowledge the increase in diversity on the bench in recent years, I strongly believe that the judiciary would benefit from an inclusion of a healthy portion of public interest attorneys, public defenders, women, persons with disabilities, racial and ethnic “minorities,” and members of the LGBTQ community. Inclusiveness across the board is a win-win for all. BIGGEST CHALLENGE IN YOUR PRACTICE I am relatively new at starting my own practice. The most challenging aspect of starting one’s own practice from scratch is learning the ropes of running one’s practice as a business. At first one has to wear all the hats associated with the operation of a business in addition to being a zealous advocate. Allocating time accordingly is a formidable challenge. There is a steep learning curve, and I am perpetually kept on my toes. Practice-Ready Lawyers The law school’s role in shaping future generations of legal practitioners here has been mounting pressure on law schools over the years to increase the number of practiceready lawyers. Many legal educators and attorneys have also criticized law schools for not providing students with enough real-world training. I have written in this column before that I believe this is not just a law school problem. It is a problem the profession as a whole needs to address. Practitioners (and regulators) decry that law school graduates are not “practice ready.” Practitioners need to understand that if they want to change that, they need to invest, not disinvest, in the game. experience. The creation of the successful incubator program for recent graduates at Thomas Jefferson School of Law is a reflection of that commitment to provide more training. In its latest effort to meet the training needs of the profession, Thomas Jefferson is expanding its experiential education offerings with an LL.M. in Practice Skills, helping J.D. degree holders meet increased demand for skills as an essential component of practicing law. This degree is slated to be available to students for the 2017 fall semester. The objective of this program is for those who already possess a J.D. to become the best attorneys they can be, providing an even higher standard of service to their clients, the courts, and communities throughout the country. Program participants will have a choice of three concentrations: Transactional Practice, Civil Litigation, and Criminal Practice. Each concentration will feature six core classes, and students will build on that core with electives taken in any discipline across the program for a total of 24 units. In that way, all program participants will have the opportunity to develop and hone their skills in critical areas such as client interaction, the business aspects of practicing law, pre-litigation and litigation, and other forms of dispute resolution. Examples of courses offered in this engaging, hands-on program include Client Interviewing & Counseling, Negotiation Theory & Skills, Law Practice Management, Deposition Practice, Litigation & Technology, and a wide variety of placements in externships and in-house, pro bono legal clinics. We as an institution owe it to our students to get them prepared to meet the rigor and challenges of legal practice in the real world. Thomas Guernsey (guernsey@tjsl.edu) is the President and Dean of Thomas Jefferson School of Law. WHY LITIGATE WHEN YOU CAN MEDIATE? LET’S GET CREATIVE, SOLVE YOUR DISPUTE, AND FIND YOU PEACE SO YOU CAN MOVE ON. BLUE SKIES AHEAD. ENCRYPTION REDUX I wrote recently and suggested that 2017 was the year for encryption. Hacking is very much on the minds of Americans, and lawyers and clients are frequently discussing the need for and manner of encryption to protect client confidences from interception by the man in the middle. Clients previously were concerned with encryption in place on lawyers’ servers and systems but are now focusing on ways to ensure that emails being exchanged over the internet are protected from interception and compromise. Because of the hacks of Democratic accounts during the Presidential campaign, you may have read that certain celebrities and Washington insiders are now using encryption applications with names like Signal and Confide. Those are free applications for mobile devices and easy to install. If the sender and the recipient both have the application on their devices, then the text, picture and video messages will be encrypted from end to end and during transit. Those applications can also encrypt the users’ phone conversations. Confide messages even self-destruct after reading and cannot be forwarded, printed or saved. These recent developments suggest that things are moving faster than lawyers might suspect. Already, there are reports of clients insisting that all of their communications with their outside counsel be conducted with the assistance of these applications. Although Signal and Confide seem to have a head start in the marketplace, surely there will be competitors moving into the business. OLD DOG, NEW TRICKS Sometimes we don’t have our mobile phone or tablet in the office or at hand, but we want to send someone a text message. Years ago, sending a text message involved a cumbersome protocol that required typing the phone number as the username at the front end of an email address. Not until 1997 did phones even have full keyboards. And you had to know the identity of your correspondent’s mobile provider. Those distant days are gone and probably forgotten. Texting today is far simpler; you type the recipient’s name, and the text is formatted for delivery. Still the older protocol remains available and viable. You can always send a text message from the email program on your desktop or laptop. Address it in this manner. Let’s use the mobile phone number (718) 5554391. Use one of these styles and type the address into the “to” field of a new email message: Verizon: 7185554391@vtext.com AT&T: 7185554391@txt.att.net T-Mobile: 7185554391@tmomail.net Sprint: 7185554391@messaging.sprintpcs.com Your email will arrive as a text message on your recipient’s mobile device. (It will even include your automatic email signature.) You still must know the identity of the mobile provider, but this method is better than nothing. If it’s a family member’s, you probably know well that carrier’s name. CAN YOU HEAR ME NOW? Most lawyers use mobile phones for business and personal calls and texts. Many of us historically signed two-year contracts with monthly payments that covered both service and the purchase price of a new phone. Though still available, the mobile phone industry has moved toward unbundling those charges. Perhaps the instigator of those changes was T-Mobile’s Uncarrier no contract initiative in 2015. Today you can purchase service for a set price per month. You can bring your own phone or purchase one from your provider or from any other source. The result has been increased price competition among the carriers. The most recent initiative at T-Mobile is indicative: three lines with unlimited high-speed data, text and calls for a flat monthly price of $100, including all taxes and fees. By the time you read this, industry prices may have declined further, but these developments suggest that we should all re-examine our present contracts and take advantage of these reduced and newly competitive rates. Bill Kammer (wkammer@swsslaw.com) is a partner with Solomon Ward Seidenwurm & Smith, LLP. CARTOON BY GEORGE BREWSTER JR.
Duncan was eying the thickness of Macbeth’s binder. Sarah, who had joined them with her own binder, added a comment. “If the matter is the same as, or substantially related to, the one in which the lawyer represented a former client, the lawyer can’t represent someone else with a materially adverse interest. Without informed written consent, of course.” Macbeth flipped through the pages in his binder. legal advice. Be sure to perform independent research and analysis. Any views expressed are those of the author only and not of the SDCBA or its Legal Ethics Committee. Ethics Luminaries Meet in San Diego Esteemed professionals discuss innovative approaches to teaching legal ethics hat do you remember about your law school legal ethics course? Youngest faculty member, likely an adjunct; a copy of the ABA Model Rules — maybe California’s rules if you went to school here; a casebook that presented “scenarios” to slice and dice. Analysis that would have made Jesuit philosophers or Talmudic scholars envious: How close to the line can a lawyer get without getting chalk on those tasseled loafers or stylish pumps? Bottom line: How far can I go without getting in trouble? All divorced, however, from the practice we then entered and the questions we had to wrestle with. Presenters included Professors Bruce Green (Fordham University, New York); Abbe Smith (Georgetown University, Washington, D.C.); Catherine O’Grady (Arizona School of Law); Tigran Eldred (New England School of Law, Boston); Richard Zitrin (UC Hastings, San Francisco); Liz Ryan Cole (Vermont School of Law); Thomas Barton, (California Western); and Tim Casey (California Western). A thick collection of scholarly papers sat at each place. the law school curriculum — allows each student to develop for her or himself a professional character; in a genuine sense to create him or herself as a lawyer, and thus to contribute to the further creation of the legal profession itself. “ethical ethos,” a cultural sense of ethical behavior that permeates their professional lives, one that enables them to address the tangible, practical issues they will confront, as we do, every day in practice. They will need to recognize — and address — the situational pressures and psychological factors (including unconscious cognitive biases) that, if ignored, can produce unintentional unethical behavior. adheres to ethical principles; that access to our profession and the judicial system is genuinely available to everyone; that in our democracy the rule of law is something more than a quaint phrase, then our society, which finds its foundation in that rule of law, may stand in jeopardy. That urgency notwithstanding, the engaged commitment of those around the table gives much room for optimism. “Skills Training for Ethical and Preventive Practice and Career Satisfaction,” of which Professor Casey is the director. Attorney: Mr. Expert, you did not tell us the professional organizations in your discipline of which you are a member. Please tell the court the names of the organizations of which you are a member. Expert: I am not a member of any professional organizations in my discipline. Attorney: Please explain why you are not a member of any organizations. Expert: I find no value in membership. Attorney: Isn’t it true you were a member of XYZ Association? Expert: Yes. Attorney: Isn’t it true you were expelled from XYZ Association for ethical violations and fabricating evidence? Expert: Yes. used by practitioners in many forensic disciplines. In 2016, the National Institute of Justice (NIJ) published a directive stating the phrase, “to a reasonable scientific certainty” may not be used in forensic reports without quantitative data to substantiate the claim.2 The NAS report stated there is too much subjectivity in many forensic reports. Relying on an unqualified forensic expert can kill your chances of prevailing in your case. You may even be led to pursue a case that cannot be successfully sustained. It’s imperative that you always have a qualified person on your side who will not be destroyed in deposition or on the witness stand in the trial. Not all forensic experts are created equal. This article takes you through some steps for vetting your forensic expert. she needs to be able to go several steps further to contribute to your success. He or she needs to be capable of conveying an opinion in lay language. Your expert must be skilled at writing a report that is sufficiently detailed to be bulletproof, yet is understandable by a person who is not an expert in their discipline. Ask your prospective expert for a sample report from the prior case that went to trial. You must know whether he or she is capable of verbally explaining his or her opinion in language that is understandable by a judge and/or jury. Have the expert explain how he or she reached the opinion stated in the sample report. Does he or she use stories to convey the concepts of the report? Social media is your friend To check your expert’s validity, social media is your friend. The internet is a valuable tool to help you easily vet your forensic expert. Use Google, Bing or other search engines. Using multiple search engines will reveal different information. Explore the expert’s profiles and posts on LinkedIn,Twitter, Facebook, Pinterest and other social media sites. If the person is a member of a professional trade organization, your search will reveal this. If he or she speaks at conferences or publishes papers in journals or writes books, you will also find this information. Read his or her posts. The person's chosen words, pictures and links to other sites will prove valuable in helping you to understand him or her. You might also find information that your opposing counsel could use in an attempt to impeach your witness. To conduct your due diligence on the internet, type the expert’s name, in different ways, into several search engines. For example, type in Mike Wakshull and Michael Wakshull. Find out what comes up. Where did the expert go to school? Where did he or she get training? Does he or she have a CV online? You will find a lot of information about the person. This information is publicly available. As an attorney or a paralegal, you have access to LexisNexis. Use it to find other cases the person has worked on. Visit the websites of the organizations of which he or she claims to be a member. Many organizations post the membership list online. Also, type the name of the person’s company into the search engine. Visit the company's website and spend some time exploring different aspects. The person's words, videos and links can speak volumes. In some instances, I have learned valuable information about an opposing examiner from my retaining attorney. In one case, the attorney had done extensive research on LexisNexis about an opposing examiner. The examiner had opined that the signature on a warrant was a forgery, even though the judge who had signed the warrant said: “I remember signing that. And that’s my signature.” The other examiner stood behind his statement that the signature was a forgery. Use whatever online tools are at your disposal to detect useful information before you hire, and then again to investigate, the opposing expert. An example from a deposition In one of my cases, I had discovered detrimental information about the opposing examiner that was readily available on the internet. In the deposition, my client attorney was able to show examples of other cases where this examiner had incorrectly presented evidence to support the side that retained him. If the opposing attorney had typed his examiner’s name into a search engine, he would have discovered that his expert had been expelled from a leading forensics organization. When the case went to trial, it was easy for me to demonstrate that the opposing examiner had skewed the evidence to make it appear to support the side that hired him. He rotated the signature so a stroke appeared to move in a different direction. does offer a diplomate certificate in other disciplines and a general forensics diplomate certificate. Not only do you want to discover where the examiner got his or her education and training, but also find out if the organization offers a credential in that area of expertise. Does the expert have the equipment necessary to perform the work? Review his or her CV to learn how he or she maintains current knowledge in the discipline. Does he or she speak before peers or publish in journals? Your expert must be skilled at writing a report that is sufficiently detailed to be bulletproof, yet is understandable by a person who is not an expert in their discipline. Know the organizations A variety of organizations offer valid certifications in different forensics programs. Regarding forensic document examination, for example, the Board of Forensic Document Examination (BFDE) offers a valid certification that is well-recognized in the industry. Are the examiner’s credentials valid for the case? There is also the ABFDE, which is the American Board of Forensic Document Examiners. The difference is the membership. BFDE consists mostly of private examiners. ABFDE’s members are mostly current and prior government examiners. Both associations are valid. What is the motive of the examiner’s trade organization? Learn whether your prospective forensic examiner is a member of a respected trade organization. Ask them whether the organization is a registered 501c(6) not-for-profit organization. The San Diego County Bar Association gratefully acknowledges its Sustaining Members for their outstanding commitment and generous support in 2017. Because no profit motive is involved in a nonprofit organization, and the officers and members of the organization are forbidden from gaining financially, you are assured that the member's purpose in the organization is for education, networking and maintaining currency in the field. On the other hand, there are for-profit businesses that pretend to be certifying organizations. They teach the subject of forensic document examination, and when the student completes the course, they receive a certification in forensic document examination as a completion certificate. Many of these “certified” examiners have little or no experience. Your due diligence will prove to be valuable As a legal professional, it is imperative that you learn the details about the background and skills of subject matter experts with whom you will partner on your case. This is especially true for cases where you will retain people who are not required to hold licenses or to have specific education for their disciplines. Always assume that the parties on the other side of your case will perform their due diligence. There are tools available to make your investigation into the person relatively easy. When you perform an extensive investigation, not only will you greatly reduce the chances of being surprised by the other side, but you will have a qualified expert on your side. Retaining an expert with strong credentials and credibility will greatly strengthen the position of your case. Mike Wakshull, MSc, CQE (mikew@quality9.com) is founder of Q9 Consulting, Inc.
xpert evidence can be front and center in any case, but it becomes crucial in science- and technology-intensive cases. The complexity associated with finding, preparing and correctly using the right experts can be high. of technology may not be allowed to access a party’s confidential information related to that technology field. The most common use of experts is to offer a testifying expert’s opinion on the merits of a claim or defense. But a party may also use a consulting expert behind the scenes to help understand the facts and evaluate strengths and weaknesses of a case; assess the damages; prepare discovery; conduct electronic, particularly, forensic, discovery; prepare for depositions; challenge the opposing expert; and plan the trial. Expert evidence differs from fact evidence in a key aspect: expert evidence is an opinion that does not have to be based on the expert’s personal knowledge. Experts rely on their training, experience and methodology. Therefore, the admissibility of this opinion is regulated through a special set of rules designed to ensure its reliability. In federal court, the admissibility of expert testimony is governed by Federal Rule of Evidence 702 and Daubert v. Merrell Down Pharmaceuticals, 509 U.S. 579 (1993). To make the most use of the expert’s help, the first conversation with the plaintiff’s expert often takes place before the case is filed, and with the defendant’s expert early in discovery. Overall, the admissibility standard is relatively lenient. In addition to the gatekeeping role of the court under Rule 702 and Daubert, the flaws in the expert evidence are regulated through the adversarial process itself: cross-examination, burden of proof and opposing expert — as well as court oversight. The most successful challenges under Rule 702 are based on the expert’s methodology, but the other grounds — lack of qualifications, helpfulness to the trier of fact and sufficient factual support — should not be overlooked. the jury is often expected and will not by itself preclude the expert opinion if it helps the jury further understand the issues. Often, however, the factual basis of an expert opinion is viewed as going to the weight of the testimony, and not its admissibility. Certain types of subject matter are generally outside experts’ purview. Most notably, expert testimony cannot be used for statutory interpretation or legal conclusions. Expert testimony is not a substitute for jury instructions, and legal conclusions by an expert would supplant, instead of aid, the trier of fact. The expert, however, may opine on issues that embrace the ultimate conclusion. For example, although overall interpretation of a contract is a legal issue, expert testimony may be admissible regarding the meaning of a specialized term in the contract. In addition, experts cannot testify regarding credibility of a witness, although they may offer specialized knowledge that may bear on the jury’s conclusion regarding credibility. The reliability of the expert’s methodology and its application to the facts is the primary concern with expert testimony. This is the area where the expert needs to be the most careful and the opposing counsel will likely be the most watchful. Check potential conflicts that may result in exclusion or prevent the expert from accessing the other side's confidential information under protective order. The expert needs to articulate the methodology and explain its application. The methodology needs to comply with any legal requirements. Novel methodologies, although not automatically discredited, should be used with care, because they are more open to attack. As with any expert testimony, relatively minor issues with the methodology, such as treatments of particular sets of data, may be left to the adversarial process. Experts are allowed to make assumptions and to extrapolate. But the evidence cannot be so scarce as to present a jump to conclusions. It also helps to have the expert conduct an independent test or investigation and not limit his support to sources that may appear biased. Olga May (omay@fr.com) is a principal with Fish & Richardson P.C. To get your case on the path to resolution, please contact Richard’s case manager Kathy Purcell at (619) 238-7282 or email kpurcell@westcoastresolution.com. Preeminent. Practical. Focused. Kathryn Karcher, for your clientâ&#x20AC;&#x2122;s appeal. Jeffrey Joseph, Esq. Robert Kaplan, Esq. Hon. William McCurine, Jr. (Ret.) Hon. David Moon, Jr. (Ret.) Hon. Leo Papas (Ret.) Gregory Post, Esq. Hon. Linda Quinn (Ret.) Thomas Sharkey, Esq. Maureen Summers, Esq. or other manners, as opposed to directly attacking the credibility or expertise of the expert, is the possibility of turning the opposing expert witness into an ally at trial. Most experts will agree that his or her opinion is only as good as the information and presumptions upon which it is based. expert has done a fine job and reached a spot-on, fully supportable opinion, but based on incomplete facts and faulty presumptions provided by counsel. In those cases, it is always better to challenge the opinion and not attack the expert. James Crosby (crosby@crosbyattorney.com) is a solo practitioner. LOOKING TO GET HIRED MORE OFTEN? mediation or settlement. However, it is important for the lawyer to consider that in proceedings that may end up in a court of law (such as in a marital dissolution), the selected engagement should ultimately adhere to the standards of a valuation engagement, thereby allowing the valuation analyst to opine on an estimated conclusion of value as it relates to the closely held business ownership interest. In fact, SSVS explicitly states that in a calculation engagement, the valuation analyst should disclose (1) that the calculation engagement does not include all the procedures required of a valuation engagement and (2) that if a valuation engagement had been performed, the resulting indications of value may have been different. Due to this difference, among others, many valuation analysts will not testify in a court of law without having completed a valuation engagement that results in a conclusion of value. This conclusion of value represents the valuation analystâ&#x20AC;&#x2122;s professional opinion or conclusion, which can typically be more impactful in a marital dissolution context as compared to a calculation of value. Lawyers should be aware, however, that this is not to say that each marital dissolution engagement should be a valuation engagement. A calculation engagement may be appropriate for certain mediation or non-mediation settlement purposes. Rather, this is a decision that you, as the lawyer, should reach in partnership with your valuation analyst; taking into consideration the ultimate goal, result and audience for each engagement. Justin Nielsen (jmnielsen@willamette.com) is vice president of Willamette Management Associates. 5 Tips to Deposing an Expert Witness Tip #1: Get all the Opinions One good thing about deposing an expert is that you can do it, in theory, with virtually no preparation. All you need to ask is, “What are your opinions? What are the bases of your opinions?” Just keep repeating those questions and you are taking a basic, starter expert deposition. Repeat like a robot until the expert has expressed all of her opinions and their bases. Tip #2: Close ‘Em Out At the end of the deposition, make sure you close out the expert by asking something like: “Have you now provided me all of your opinions and the bases for them that you intend to express at the time of trial?” The reason to do so is that once they say “yes,” they cannot provide new opinions at the time of trial. Kennemur v. State of California (1982) 133 Cal. App. 3d 911.
instead from distance. He didn’t want to fight Goliath where he was strongest. In our cases, often the expert knows more than us about the subject matter. Most times, you won’t beat the expert in her chosen field. So, you may have to fight elsewhere at the time of trial. Is the expert biased? Did the attorneys only provide her certain facts or documents? Has another court ruled her testimony is unreliable or does she have something in her background that affects her credibility? Whatever it is, figure out where you want to fight at trial and develop the foundational testimony during the deposition. By John Gomez rat bite fever case. He wanted to talk about standards and literature. But I asked him something like, “Don’t you think a parent would want to know that buying a pet rat could end up with their kid dying?” Don’t be scared to use plain language and apply it to your case. Tip #5: Be Civil Lots of lawyers get worked up and mad when they depose the other side’s expert. Their questioning may be aggressive and hostile. I don’t think that works. The deposition is a time to get information, not beat somebody up. Being courteous and civil is much more likely to lead to an expert being forthcoming and complete. Besides, we practice law in San Diego. That means we do so with civility, integrity and professionalism — even when we think the other side’s expert may be dishonest or is killing our case. John Gomez (john@gomeztrialattorneys.com) is founder and president of Gomez Trial Attorneys. Clients want to be heard; use these techniques to ensure you truly listen. awyers express themselves on behalf of others for a living, whether the work is done in a courtroom or from behind a desk. As a result, some practitioners would likely be amused or offended at the notion that they might not be effectively communicating with their own clients. Yet, the No. 1 reason for client complaints to the State Bar of California revolves around lack of communication with their lawyer. The truth of the matter is that lawyers get busy. And when lawyers get busy, there is often a rush to get things done, move on to the next project, check boxes, get things filed and go, go, go! Communication — real communication — suffers as a result. As George Bernard Shaw once said, “The single biggest problem in communication is the illusion that it has taken place.” Be honest with yourself and think about the way you practice and communicate. If you’re open to it, there are two methods that can help you see immediate positive changes in the quality of communication with your clients: active listening and compassionate responsiveness. Active Listening There’s a video circulating on YouTube in which you see a woman and a man from behind sitting together on a couch, and you hear her complaining about this constant ache in her head and how frustrated she is with it. She turns to the man, showing her profile, which features a large nail stuck in her forehead. The man, clearly frustrated himself by her complaining, says, “It’s because you have a nail in your forehead.” Instead of fixing the problem, this just sets off the woman about how it’s not about the nail in the forehead. She doesn’t want him to fix anything; she just wants him to listen to her. So, when she finishes her second rant and his response is, “That must be very frustrating,” she feels validated and heard. they did or failed to do. In that “analysis mode,” all the lawyer is doing is focusing on how she or he will fix the problem, spin bad facts or meet elements of a cause of action, and ends up missing a great deal of the information being shared. Active listening is a skill that has been raised with growing frequency in the legal field, from Gerry Spence’s Trial Lawyers College to Brene Brown to the SDCBA’s own Dialogue on Diversity in 2016. The idea is to turn off the “fix-it” mode and listen to the client. five tips on how to listen better 1. Sit with your client, instead of across from them with a desk or table between you. As counselors, we fix things. That’s what we get paid to do. But it’s not all that we should be doing to ensure that we are engaging in effective communication with clients. client's body language as he or she speaks to get a better understanding of how he or she is feeling. there is no judgment, just a real attempt to understand. 4. Remember it’s not about you, or how you would have handled a similar situation. It’s about the client. Be there to be of real service. 5. Help your client be heard. Sometimes while listening, you’ll get to the point where the client is “stuck” or at a loss for words. You can focus in on what you’re feeling from listening to the person and give him or her a little prompt, like the one in the YouTube video where the man said, “That must be very frustrating.” If it’s true, the client will agree and it will help fuel him or her. If not, they’ll likely correct you (which doesn’t mean you did a bad job, it just means you helped the client understand what was not correct and help guide him or her to what was correct). Compassionate Responsiveness The amount of phone calls and emails lawyers receive can be overwhelming sometimes. When there’s nothing going on in a case, talking to that particular client might drop a few levels in the priority perspective. You know nothing is going to happen for the next 30 days. But does your client understand what that means? You may have told the client, but with his or her stress or pain level, how much of the conversation did he or she take away? Make sure to give your clients regular updates on what is happening or even why nothing is happening in their case. If you don’t have time to do it proactively, then make sure you respond within a business day when a client contacts you. There’s no worse feeling than rejection, and silence can often be misconstrued for it. Contrary to most common intakes or client interactions, being heard is different from being questioned, interviewed or judged for what they did or failed to do. A good rule of thumb is to respond to each client in the way you’d want someone to respond to your loved one going through the same process. When it’s too much and you don’t have time to sit down and type out a meaningful response, take 30 seconds to type or tell them that you’re swamped today but wanted to let him or her know you got the call/email and will get back with a meaningful response by X day. Unless it's an emergency, most clients will be satisfied with that because they want you to be able to take the time to compose a meaningful response. The better you can communicate with your client, the stronger your understanding will be of how you can best represent him or her and the fewer miscommunications or hard feelings will exist during the process. You’ll be a better lawyer for it, and your clients will feel secure in the placement of their trust in you. Renée Galente (renee@galentelaw.com) is a director for the San Diego County Bar Association and owner of Galente Law, APC. Matthew Liedle is a long-time board member for Hope For A Cure Foundation, a nonprofit that raises money to purchase and donate cancer research equipment. His countless hours of work have been instrumental in keeping HFAC moving forward in the fight against cancer. Since 2004, HFAC has donated 17 pieces of equipment to cutting edge researchers at local cancer centers, including UCSD Moores Cancer Center, Salk Institute, Scripps Research Institute, and Sanford Burnham Prebys Institute. Most recently, HFAC donated a sonic dismembrator to UCSD Moores Cancer Center. The device helps researchers discover genes that can be tested for mutations, in order to select treatment options for certain cancer patients. Visit www.hopeforacurefoundation.org to donate or volunteer. You can also support HFAC by playing in the Society of Marketing Professional Services annual golf tournament on June 2, 2017. Proceeds will benefit HFAC. Sign-up at www.smpssd.org. An AV Rated partner with Liedle Larson Lidl & Vail, LLP, Mattâ&#x20AC;&#x2122;s practice includes construction, surety, general liability, product liability, professional malpractice, business disputes, and government matters Matthew Liedle is not affiliated with the Law Office of Steven C. Vosseller. After each case, we donate a portion of attorneyâ&#x20AC;&#x2122;s fees to a nonprofit chosen by the client. s pressing the snooze button on that early morning alarm part of your daily routine? Perhaps you just don’t consider yourself a morning person or you make up excuses that you don’t have enough time to sweat before heading into the office. According to studies conducted by Appalachian State University1, there are numerous benefits of getting to the gym earlier in the morning. From sleeping longer at night and higher levels of relaxation to lowering blood pressure, research shows that the best time to exercise is first thing in the morning. You may not be a natural-born morning person, but with a few simple tips it can be a smooth transition to make your early morning sweat a brand new habit. Think you might want to try working out before sunrise? Here are five tips to help you get in your workout and start your day on the right foot. 2. Limit screen time Avoid watching TV, using your phone or playing on any other digital devices at least one hour before bedtime. Screen time at night keeps you from falling asleep and sleeping well. Your brain’s electrical activity increases, which keeps you from calming down into a peaceful state of mind for quality sleep. in your morning workout. The feeling you get when you pushed past a hill or were able to get in one more rep. And just remember: No one ever finishes a workout and thinks, “I wish I’d hit snooze and skipped that workout!” Maria Disla is founder and CEO of Pure Indoor Cycling. 3. Set out tomorrow’s workout clothes Choosing your outfit the night before will help reduce stress and save you time in your morning routine. Waking up and seeing your workout outfit laid out will be a great motivator to get you up and on that bike. 4. Stretch Instead of hitting the snooze button, take the extra 10 minutes to stretch. It’s a great way to energize your day and ease away any stress or tension from the previous day or a funky sleeping position. Our Work & Wellness Visit the SDCBA's new web page dedicated to wellness for lawyers, including discounts at Pure! laws and treaties. Join us as we highlight resources to keep you abreast of changes relating to trade, treaties, NAFTA, investing and international tax. Human Trafficking (July-September): Human trafficking is a modern form of slavery. It involves controlling a person through force, fraud or coercion to exploit the victim for forced labor, sexual exploitation or both. We will bring to light the “hidden” reality of how the border acts as a crossing for human traffickers and their victims into the U.S. through San Diego. We also will share resources on how to recognize the signs of human trafficking and talk about where to report it and how to get help. Environmental (October-December): The Tijuana River has long been a source of discussion between San Diego and Tijuana. Sediment, polluted storm water, trash, and manufacturing and agricultural waste have been problematic in the region for decades. Numerous laws and governmental agencies are involved, making cleanup and regulation problematic. Learn about these issues and what is being done to help the environment and keep communities safe. Please join us throughout the year ahead as we learn about changes in the laws that affect the border, and discuss what they mean to our community. A new partnership. Same focus. ach year, the San Diego County Bar Foundation awards grants to local organizations that offer legal and public services for underserved San Diegans. As the charitable arm of the San Diego County Bar Association, hundreds of children, elderly, domestic violence victims, immigrants, veterans and many more in need are helped by the funds raised each year by attorneys, judges, legal professionals and community members. “We’re calling on all attorneys, judges, and legal and allied professionals to donate the monetary equivalent of one hour of your billable time, or any amount you see fit,” said Micaela Banach, the Bar Foundation’s board president. The Bar Foundation’s funds come from contributions from the local legal and business communities and from fundraising programs throughout the year, including its signature “Evening in La Jolla” benefit. Banach added, “We’d like to see the entire legal community participate in our ‘Give an Hour’ program. This will help us reach even more San Diegans in need.” With that in mind, here are the 10 reasons to “Give an Hour”: 1. We know time is scarce, but we also know time is money. You may not always have time to volunteer at your favorite local charity, but giving an hour this way can make a huge difference. 2. You can donate to multiple organizations with one donation. Since its inception, the Bar Foundation has granted more than $2 million to 50 legal aid and public interest organizations throughout San Diego County. Your one-time or recurring donation will help a wide variety of individuals and groups. For a full list of previous grantees, visit www.sdcbf.org/grant-programs. 3. We’ll do the research for you! You don’t have to spend hours reviewing the dozens of local organizations that provide legal assistance and education in San Diego to figure out which one to donate to. The Bar Foundation undergoes a thorough review process of local charitable organizations and awards grants to those that strive to close the justice gap by supporting thousands of children, elderly, domestic violence victims, immigrants, veterans and so many more in need. 7. You can donate a little or a lot. It all helps! Choose the level that’s right for you — Still in Law School ($25), My Best Friend Is a Lawyer ($50), Yeah, Got My First Job as an Associate! ($100), Just Made Partner ($250), In-House Counsel, You Know What That Means ($300), At the Top of My Game ($500) or any other amount of your choice. Need three more? Here are just a few of the types of people you will help with your “hour”: 8. Help a North County mother escape domestic violence. Your donation helps domestic violence survivors through organizations like the Community Resource Center and the San Diego Family Justice Center Foundation. Here, these survivors receive assistance filing for temporary restraining orders, divorce and child custody — all essential to permanently escape abuse and establish long-term safety and stability. 9. Educate a Burmese refugee on the American legal system and his or her rights. The Bar Foundation’s grants benefit several different immigration and refugee nonprofits, including Karen Organization of San Diego, Casa Cornelia and Jewish Family Service. Karen Organization executive director Nao Kabashima said, “This grant truly means that all of us, regardless of race, ethnicity, religion or immigration status, are important parts of San Diego and should have equal access to justice in this society.” 10. Provide community legal clinics to homeless youth. Through organizations like Think Dignity and Father Joe’s Villages, San Diego’s homeless community is able to access legal services and help break the cycle of homelessness and poverty. Deacon Jim F. Vargas said, “The Homeless Court Program and the generous funding from the Bar Foundation is critical to ensuring that our homeless neighbors, who have worked hard to address their issues, can access the housing they need.” For more information about the San Diego County Bar Foundation, or to make a donation, visit www.sdcbf.org/giveanhour. Above: Karen Organization of San Diego (KOSD) legal workshop. Larkapor Moo, KOSD's Program Manager, has been hosting various community workshops for legal-related issues. CaseyGerry Partner Robert Francavilla was honored as 2016 Trial Lawyer of the Year by the Consumer Attorneys of San Diego. Julie Myres, outreach coordinator with the San Diego Superior Court, was recently honored by the American Bar Association with the Burnham “Hod” Greeley Award. Littler Associate Kyle Nageotte was elected as chair of the California Young Lawyers Association. Candace Carroll, of counsel at Sullivan Hill Lewin Rez & Engel, was named 2017 chair of the San Diego Convention Center Board of Directors. Attorney Gil Cabrera was named vice chair of the board. Pettit Kohn Ingrassia & Lutz Shareholder Valerie Garcia Hong was recently honored by the Filipino American Cultural Organization with the HIYAS Award for outstanding achievement in the field of law. Priyanka Talukdar, Sullivan Hill Lewin Rez & Engel associate, was recently appointed to the South Asian Bar Association, San Diego Chapter board of directors. San Diego County Bar Association Executive Director and CEO Ellen Miller-Sharp is the recipient of the Friend of the Organization Award from the Tom Homann LGBT Law Association. Krystal Weaver, associate with Wilson Turner Kosmo LLP, was elected president of the San Diego chapter of the Federal Bar Association. Carolina Bravo-Karimi was elected as president-elect for the organization, and Morgan Suder was elected president of public relations. Passings Harley Mayfield recently passed away. After a career as a naval aviator serving with astronauts Schirra and Shepard, Harley joined the California Attorney General’s office. He won a United States Supreme Court case and became head of the criminal division in San Diego. Harley was known for his intellect, honesty, fairness and subtle sense of humor. Attorney Roscoe Keagy passed away in January. Roscoe practiced condemnation law and was the attorney of record for many state appellate decisions and several state Supreme Court decisions. 100 PERCENT CLUB 2017 The San Diego County Bar thrives only because of the support and talents of each and every one of our members. Thank you to our “100% Club” firms, whose attorneys are all members of the SDCBA in 2017. Your leadership and dedication to our profession is truly appreciated. PHOTO GALLERY DIALOGUE ON DIVERSITY Photos by Alicia Countryman California Supreme Court Justice Hon. Goodwin Liu discussed implicit bias and the importance of diversity at the SDCBA's Annual Dialogue on Diversity on February 23. Thank you to event sponsors California Western School of Law; CaseyGerry; Cozen O'Connor; Higgs Fletcher & Mack LLP; Klinedinst; Littler; Paul Plevin, Sullivan & Connaughton LLP; Procopio; San Diego Business Journal and Wilson Turner Kosmo LLP. ANNUAL BENCH-BAR RECEPTION Photos by Jason de Alba Attorneys and judges spent an evening together at the SDCBA's Annual Bench-Bar Reception on March 7. Thank you to event sponsors Antonyan Miranda; Thomson Reuters Westlaw; AHERN; Torrey Pines Bank; Valdez Team; Ringler and Judicate West. Photos by Steve Silva High school students from all over San Diego County competed in this year's mock trial competition in February. Thank you to all of the coaches and attorney volunteers. SDCBA leaders represented the Bar at the annual meeting in Florida. BAR LEADERS DINNER San Diego bar leaders gathered for dinner and discussed ways to continue collaborating. Referrals - It’s a matter of dollars and sense. The attorneys of Panish Shea & Boyle LLP have obtained some of the most significant verdicts and settlements in U.S. History - often setting records with their trial results. With more than fifteen 8-figure verdicts in the last 5 years, no other California firm wins this big as often as Panish Shea & Boyle LLP. Our presence on a case delivers maximum benefits and recovery, both to the client and the lawyer who refers the case. You’ll get the resources, experience and skills needed to win the most complex cases for individuals who have suffered injury from the wrongful acts of others. The firm handles third party cases and joint ventures with attorneys who want to stay more actively involved. Contact Panish Shea & Boyle LLP today to discuss how we may assist you.